The healing powers of music come alive! Home > Campus News > The healing powers of music come alive! 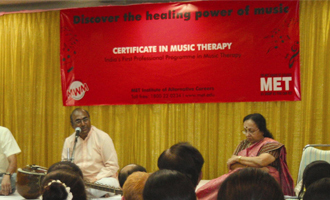 MET League of Colleges conducted a one day seminar & live demonstration on Music Therapy by Pt. Shashank Katti, Music Maestro on March 19, 2010 at the MET Convention Centre. Over 150 music lovers from around Mumbai and various parts of Maharashtra participated in this event.